There has been no official response from the Catalan government since Spanish Prime Minister Mariano Rajoy issued a five-day deadline to clarify whether or not it had declared independence. If it has then Madrid will give Catalan leaders another three days to withdraw it or else Prime Minister Rajoy will invoke Article 155 of the Constitution suspending the region’s autonomy. “On October 1st, the government of Catalonia wanted to carry out an illegal referendum. This was not an innocent, spontaneous or democratic decision. It was the last chapter in a political strategy devised to impose on Catalan society and all Spanish an independence that few want and is good for nobody,” said Prime Minister Rajoy as he issued the deadline in an address to the Spanish parliament. 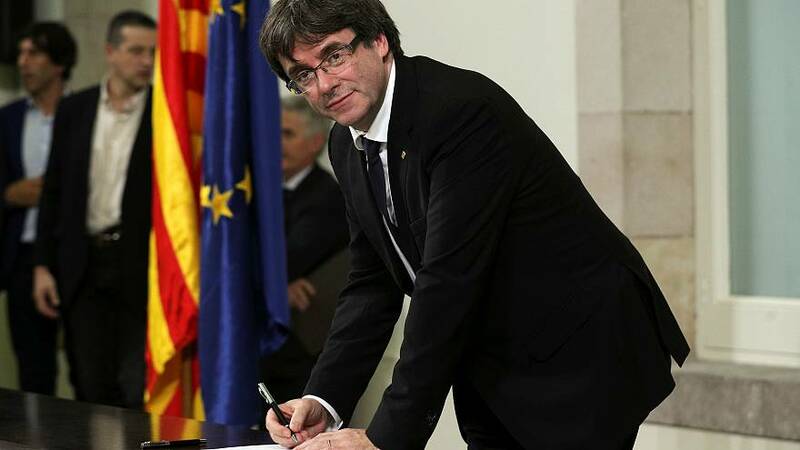 Catalan’s leader Carles Puigdement issued a declaration on Tuesday (Oct 10) but immediately suspended it to allow for talks with Madrid. Demanes diàleg i et responen posant el 155 damunt la taula. Entesos. Spain has been in turmoil since the separatist government held a disputed referendum in Catalonia on October 1 which Madrid said was illegal. As the country goes through its worst political crisis in decades it is holding its National Day celebrations in an atmosphere of doubt and uncertainty.